These words were included in the “peace initiative” presented in May 1989 by Israel’s Labour-Likud national unity government. Twenty-five years later, the “Jordan option” is back and being increasingly mentioned in the media. The Mandate for Palestine had direct, complete and explicit jurisdiction over the area that, in 1922, became the Emirate of Transjordan for eight months: from July 1920, when King Faisal was thrown out of Damascus, to March 12, 1921, the day of the Conference of Cairo which, in Winston Churchill’s words, sanctioned “the policy to be adopted with regard to Trans Jordania”. Whenever there is a concrete effort to push forward the peace process, talk about “a substitute homeland” for the Palestinians re-emerges. Most of those supporting this scheme claim that well before the partition suggested by the UN General Assembly in 1947, the Zionist movement suffered a mutilation of territory following the unilateral British decision in 1922 to separate Transjordan from the rest of the land subject to the Mandate for Palestine. They argued that the Palestinians already had a sovereign state – Jordan – and that, therefore, Israel, even by incorporating today’s West Bank and Gaza Strip, would comprise only 22 per cent of the whole “historic Palestine”. It was a “partially legal” time lapse even from the juridical perspective imposed by European powers, given that the Mandate for Palestine was formally assigned to London by the League of Nations on July 24, 1922, becoming operative in September 1923. Transjordan was thus part of the Mandate for Palestine with the proviso that Britain might administer it separately and for a period which at best may be considered scarcely relevant. I am not sure how the PLO charter would refute that "never did the land beyond the Jordan have a religious, social or cultural value comparable to the land between the river and the Mediterranean Sea". Abū Khālid Thawr Ibn Yazīd al-Kalā‘ī (764–854): “The holiest place [al-quds] on Earth is Syria; the holiest place in Syria is Palestine; the holiest place in Palestine is Jerusalem [Bayt al-maqdis]”. The perception of the local population is what it mattered and what it matters. "For the purpose of this Order: (1) The expression ‘Palestine’ includes the territories to which the mandate for Palestine applies, except such parts of the territory comprised in Palestine to the East of the [River of] Jordan and the Dead Sea as were defined by Order of the High Commissioner dated 1 September 1922". Government of Palestine, Proclamations, Regulations, Rules, Orders, 1925. 3) "Indeed, from the moment Prince Faysal set up a government in Damascus in October 1918, he stressed that Palestine was a part of Syria. At the Paris Peace Conference...". a) Chaim Weizmann to his wife, July 17, 1918: “I made the acquaintance of Fayṣal [...]. He is not interested in Palestine [...] He is contemptuous of the Palestinian Arabs whom he doesn’t even regard as Arabs”. 2. 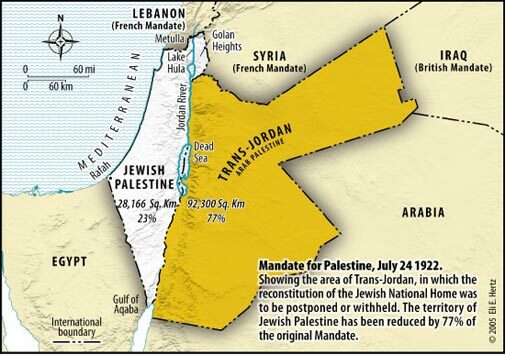 "Transjordan was always included in the annual Report for the Mandate for Palestine presented to the League of Nations Permanent Mandates Commission." So What? Palestine mandate was a joint mandate comprised of two states. In Yithak Gil-Har's words: "Great Britain had always treated Trans-Jordan as a political entity completely separate from Palestine. Its inclusion within the framework of the Palestine Mandate was an outcome of the political events following the fall of Faisal’s government in July 1920. The Palestine-Trans-Jordan boundary served as a political barrier separating two states. Therefore, the postulation by some writers that the boundary was merely administrative in its character, delineating two territories subjected to the one British rule within the British Empire has no foundation in reality”. The Note to which you referred to did not mention what you claim. Two peoples, two rights, two states.